A new update of the NUFLI Editor is out. 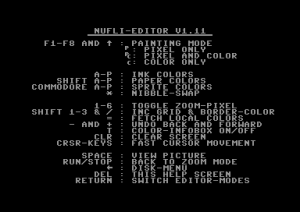 With this editor (PAL/NTSC) you can edit NUFLI (static) image directly with your Commodore 64. It is finally out! 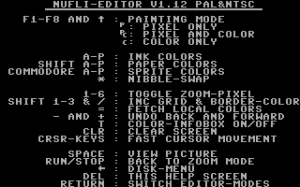 With this editor (PAL/NTSC) you can edit NUFLI (static) image directly with your Commodore 64. Version 3.0 – What’s new? 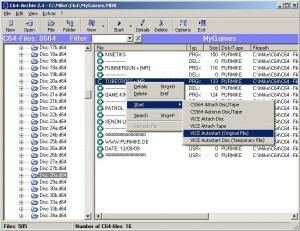 NEW: Gamebase64 frontend with the possibility to download games. 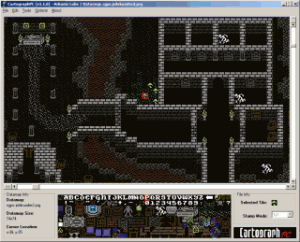 NEW: Simplified editing of profils. NEW: In the main window you can hide the tree. New: “Data Types” support has been built in. New: press spacebar to print a space on the screen. New: top window changes color depending on which editing mode you are in. Gray = regular edit, blue = data edit. Fixed: the z-bug is fixed. we can now load files with z in the file name. Fixed: 40×25 screenshot save was not saving the very last byte. now it is. Fixed: project loader used to abort if an error was found (ie file not found). it now continues through and still tries to load all remaining project files. Fixed: when editing in multicolour mode and then going into menu, some text would appear in multicolour instead of hires. 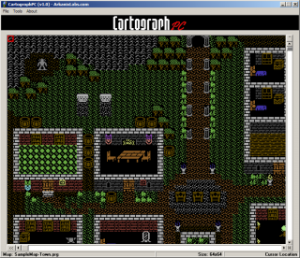 Converter tool is now built directly into editor (export feature) and will convert a map from 256×128 (Cartograph standard) to whichever size is specified in the preset menu. Updated menu screen to include the above converter. Fixed a startup bug where the map size is different than what is specified in the preset menu. Minor color touchups to the filename requestor box in the menu. Centering feature to jump to the very middle of the map in editing mode. Version 2.4 – What’s new? 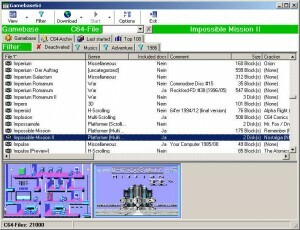 NEW: Improved profils for VICE 2.1. NEW: Improved performance scanning a folder. NEW: Improved performance working with zip-files. BUG fixed: Whole filename wasn’t displayed sometimes. BUG fixed: Files in the temp-folder were deleted in the recycle bin.